The Sumatran Tigers (Panthera tigris sumatrae) is a subspecies of tiger that are regarded as the last of its kind to ever existed in Indonesia. Two of its relatives, the Balinese tiger and the Javan tiger had been lost of any existence trail in the nature upon where they live. On the other hand, Bali tiger was declared extinct since the 1940s while its relative Java Tiger was declared non existence since the 1980s. In the late 1970s, the population of Sumatran tigers are believed to range from about 1,000 individuals, then decreased to about 400-500 individuals in the early 1990s. Based on data from the Ministry of Environment and Forestry (2007), the current estimate of the tiger population in eight areas that had been identified from the existing 18 district only about 250 individual tigers, while in 10 other regions the have not been analyzed yet. But experts believe the population of the Sumatran tiger is no more bigger than the estimate of the 1990s. Now the world is again reminded of the importance of the role of the King of the Jungle with the International Tiger Day which falls annually on 29 July. This is the fifth year since the International Tiger Day celebration set on November 23, 2010 in St. Petersburg, Russia. In the St. Petersburg Declaration on Tiger Conservation, they made a mutual agreement that the world will seek to doubly increase the existing wild population in 2022. An important role in the ecosystem for the tiger were clearly stated in the declaration, that this predator is one important indicator of a healthy ecosystem. Destruction of ecosystems not only resulted in the extinction of tigers, but also the loss of biodiversity. Indonesia is included as one of the countries that signed the Declaration on Tiger Conservation in St. Petersburg, Russia in 2010. In fact, the Ministry of Forestry in 2007 and had made a Conservation Action Plan valid until 2017. Sumatran tiger has the body relatively small compared to all the sub-species of tiger alive today. Adult males may have a height up to 60 cm and a length from head to toe reaches 260 cm and weighing up to 160 kg. Tigers has an average length of 199 cm and weighing up to 92 kg. Sumatran tiger has the darkest color of skin among other tigers, its from reddish yellow to dark orange. Sumatran tigers are on the brink of annihilation due to habitat loss that went uncontrolled, reduced number of prey species, and illegal hunting. A 2008 report released by TRAFFIC – a program of the WWF and the World Conservation agencies, IUCN, for the wildlife trade watchdog – found a flourishing illegal markets and also the open domestic market trade in Sumatran tiger body parts. In the study TRAFFIC revealed that at least 60 tigers have been hunted each year in the period 1997- 2003. Decisive action taken to stop poaching and illegal trade of tigers must be done in Sumatra. Sumatran tiger population is only about 500 that are currently living in the segments of mountainous rain forest, lowland forests, and wet lands. Most of this area is threatened by forest burning for agriculture and commercial plantations, as well as encroachment by logging and road construction. Due to the fact of the loss of their forestry habitat, tigers are bound to enter a location near to people’s home and thus are often butchered or taken as pets because they strayed into the rural areas or as a result of accidentally encountering with humans population. Riau Province is home to a third of the entire population of the Sumatran tiger. Unfortunately, although they are already protected by law, the tiger population has declined by 75% in the last 25 years. 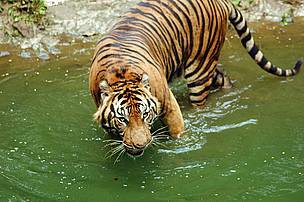 In 2008, approximately 195 Sumatran tigers left in the wild province of Riau. Although there are action plans and agreements between countries, the reported death of Sumatran tigers continue to flood the media. Including conflicts with farmers in Jambi for the past two years at the expense of 46 tigers, as well as “mismanagement” at the Surabaya Zoo which eventually also make the tigers there to perished. What is the status and distribution of the latest Sumatran Tiger? What and how the current threat level? What has been and can be done for current government stakeholders to save the tigers? These questions must be answered to make an appropriate action to save the Sumatran tiger. Ensuring the Sumatran tiger population is not easy as it requires specific methods and equipment, including using camera traps. To observe the tiger, camera traps is installed in place of the tiger population habitat. Tigers live in forest lowland tropical rain area. However, the tiger habitats are disappearing along with the reduced forest area to the entire island of Sumatra due to conversion of forest to oil palm plantations, commercial plantation development, settlements, roads that cut through the forest area and for other purposes. The condition causes the tiger habitat to become fragmented thus causing conflict with people. The Tropical Forest Conservation Action for Sumatra, which is a program of collaboration between the Government of Indonesia and the Government of the United States in the conservation of the Tropical Forests in Sumatra is to encourage the strengthening of support and active involvement of the public, government and private sector in order for tigers to remain exist in nature. 1) Protection and restoration of the area that serves as an habitat and corridors between habitats; including conducting patrol for forest protection and rehabilitation of degraded area collaboratively by the Government together with the Private and Public sectors. 2) Structuring the habitat location that are more attentive to environmental aspects, including the evaluation of Spatial Planning, Land Use Plan and Local Development Plan. 3) Protection and intensive monitoring of the population, including anti-smuggling patrols done by rangers and community and population monitoring using scientific principles. 4) Handling of Conflicts between tiger and human, for example by strengthening human resources (people and government) in dealing with the conflict, increasing habitat restoration efforts for Tiger, Sumatran tiger translocation of conflict-prone areas to safer areas. 5) Increased public awareness and strengthening the effectiveness of law enforcement. Sumatran tiger (Panthera tigris sumatrae) is one of six sub-species of tigers that still survive to this day and is included in the classification of critically endangered species. Based on 2004 data, the population of tigers in the wild is only about 400 individuals only. As the primary predator in the food chain, tiger maintain populations of wild prey that is under control, so that the balance between prey and vegetation that they eat can be maintained. Sumatran tiger face two types of risks to their existence: threatens by the illegal trade in body parts where they are bought and sold at high auction places on the black market for traditional medicine, jewelry, and decorations and they are losing their native breeding grounds due to the high rate of deforestation. In 2006, the Indonesian government declared a critical region, Tesho Nillo, as a National Conservation Park to provide a better habitat location for the complete existence of this type of Tiger. In 2011, At the Tiger Summit in South Africa, , Indonesia and 13 other countries that protect tigers committed to a goal of ambitious species conservationist ever made namely TX2. The purpose is to add large number of tigers until the end of 2022, the year of the Tiger next. Indonesian National Tiger Recovery Program is now part of the global objectives. Then it encompass six Sumatran tiger priority landscape: Ulumasen, Kampar-Kerumutan, Bukit Tigapuluh, Kerinci Seblat, Bukit Balai South Rejang, and Bukit Barisan Selatan. WWF is currently initiating fundamentals research on Sumatran tigers in Sumatra, installing hidden camera to tracked wild animals numbers, distribution and habitat to analyze wildlife location in need of protection. WWF also founding groups that work to reduce human-tiger encounter in surrounding area and registering anti-poaching units. WWF Indonesia is proud to be an important part of TX2.